The Cocoon Nebula (also known as IC 5146 and Collinder 470) lies four thousand light years away and spans approximately 15 light years. It is a combination of emmision and reflection nebula, primarily the former. It is a star-forming region containing a cluster of very young (i.e., a few hundred thousand years old) stars that excite the hydrogen gas from which they were formed. Their light is also reflected by some of the surrounding gas and dust. 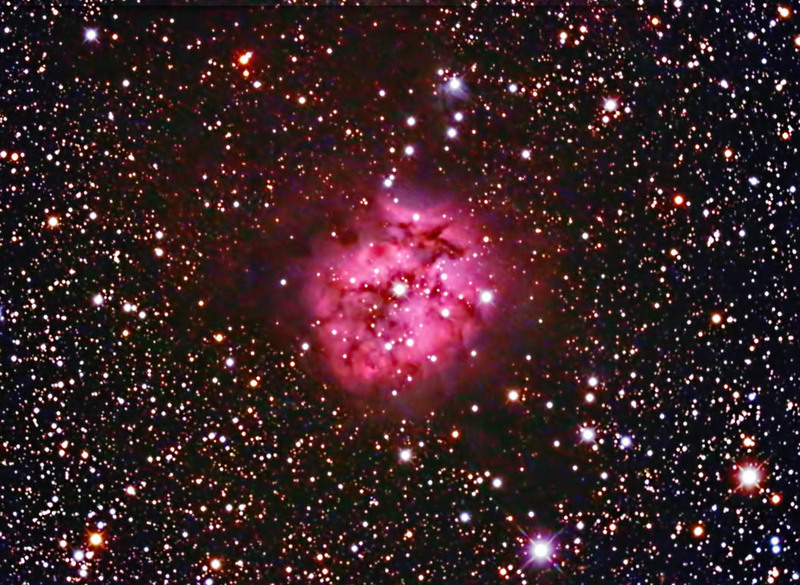 The dark nebulosity that surrounds the Cocoon Nebula is Barnard 168. It obscures some of the stars within the Cocoon. Color: 18 @ 5 min. Color images were focused usingt the camera's live view. They were reduced, aligned and combined in ImagesPlus. Ha images were focused, reduced, aligned, and combined in CCDSoft. The color nad Ha images were aligned in RegiStar. They were then blended and adjusted in Photoshop. Finally, Topaz Detail and DeNoise were applied. It was first light for this scope when capturing the color images. Taken from my backyard observatory in southeastern Minnesota on 7/20-21/15 (color) and 9/21-22/15 (Ha).